It all started with gin number 47. 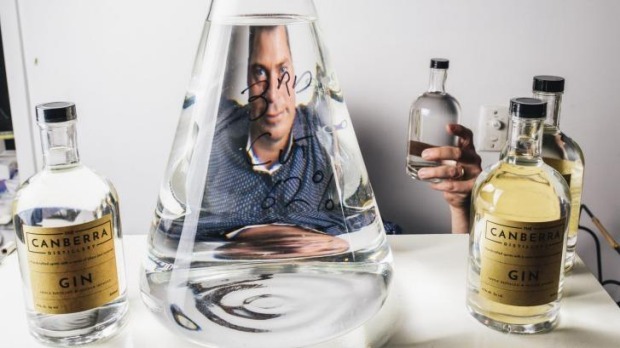 Economist Tim Reardon had been playing around with his gin still in his backyard in Kaleen - he'd racked up "plenty of failed experiments" and had a lot of fun but when he walked into the shed one morning in May this year, it was filled with a sweet aroma. His 47th gin was a success, with a delicate, almost floral nose. "The neighbours were quite impressed," he says. It was then that Reardon decided he would launch his own distillery. Six months of paperwork later, the Canberra Distillery was born. Reardon hopes to add to a homegrown drinks scene that includes BentSpoke Brewing Co and Kevin Hingston's Pact Bear. "I'm Canberra born and bred and it's not just a public service town," he says. Reardon reckons that BentSpoke will be the first Canberra bar to serve his gin and is talking to other pubs and venues. He says he was inspired to start making his own gin several years ago when he went to help a friend work on the picturesque Redlands Estate distillery in Tasmania. "There isn't a distillery in Canberra and there's a huge market for it," he says. 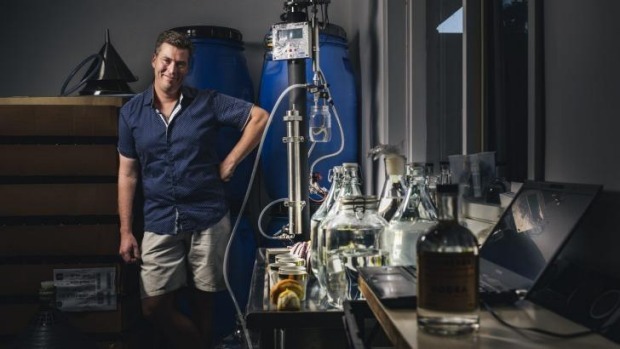 The closest we have previously come to a new Canberra gin is Poor Toms - the brainchild of two ex Canberra boys in Sydney who crowdfunded their new gin label earlier this year. He bought a still, modified it for vodka and gin, and set himself up in a shed in the backyard of the family home. "I spent three years playing around with different things. I decided to go down the gin path, partly out of preference - I've always liked the gin, the sambucca type liquor. It captured me." Reardon is an economist by trade and worked for years in the energy regulation and lobbying field. He says he enjoys the science of making spirits and "the art of creating a gin and finding those flavours". The Canberra Distillery's first product is a classic London dry gin but he's also experimenting with seasonal botanicals. After the success of Gin No 47 earlier this year, Reardon decided to take the plunge and set up a proper distillery to sell gin and vodka. It was a lot of red tape to get his backyard operation certified. "If I'd known how hard it was I wouldn't have started," he says with a laugh. He's also quit the day job, perhaps a little earlier than anticipated. "It was my longer term plan [to work full time distilling] but it probably arrived sooner than I was expecting," he says. There's no retail outlet at this stage - it's just bars, pubs and other venues - but Reardon hopes to sell online soon via thecanberradistillery.com.au (the website isn't live at present).